Each year the Frank Madla & Irma Rangel Texas Legislative Internship Program at St. Mary’s University provides St. Mary’s undergraduate and graduate students with opportunities to experience the state legislative process through hands on application. 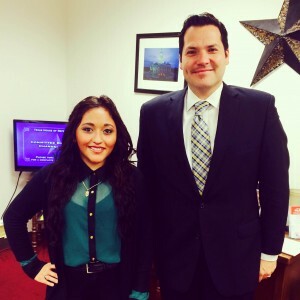 Interns receive placement in either an office of a Texas senator or state representative. This year four St. Mary’s students received placements during the spring semester. Barbara Falcon-Mendoza interned with Rep. Justin Rodriguez (D-San Antonio), Jose Casillas with Rep. Poncho Nevarez (D- Eagle Pass), Antonio Anguiano with Rep. Terry Canales (D-Edinburg) and Andrew Morlet was also placed in an internship. Political Science professor, Arturo Vega, Ph.D., currently oversees the program and is a proud advocate for the program. Students enrolled in the internship program take a course with David C. Courreges (J.D./M.P.A., ’05), a St. Mary’s School of Law Distinguished Young Alum. Courreges, founding shareholder of Courreges, PC, also serves as the student internship supervisor, offering a legal perspective to the experience. “So far this has been one of the most rigorous things I’ve participated in,” said Barbara Falcon-Mendoza. Falcon-Mendoza is a first-year undergraduate student and a Political Science major at St. Mary’s University. In the midst of navigating through her first year of college, she is also learning to navigate and understand what it means to be an intern for a representative appointed to handling appropriation, pension and rules and resolution committees for District 125. Not only is Falcon-Mendoza thankful for her opportunity to work with policy makers, but also considers herself fortunate to have a legislative internship during her first year of college. According to Falcon-Mendoza, most of the interns she encounters are law or graduate students.